The New Hampshire seacoast is abundant with dining options but there’s nothing quite like a dining experience at Moxy in Portsmouth, New Hampshire. The concept is “modern American tapas” — New England inspired food adapted into smaller plates and individual bites meant to be shared (or not!). 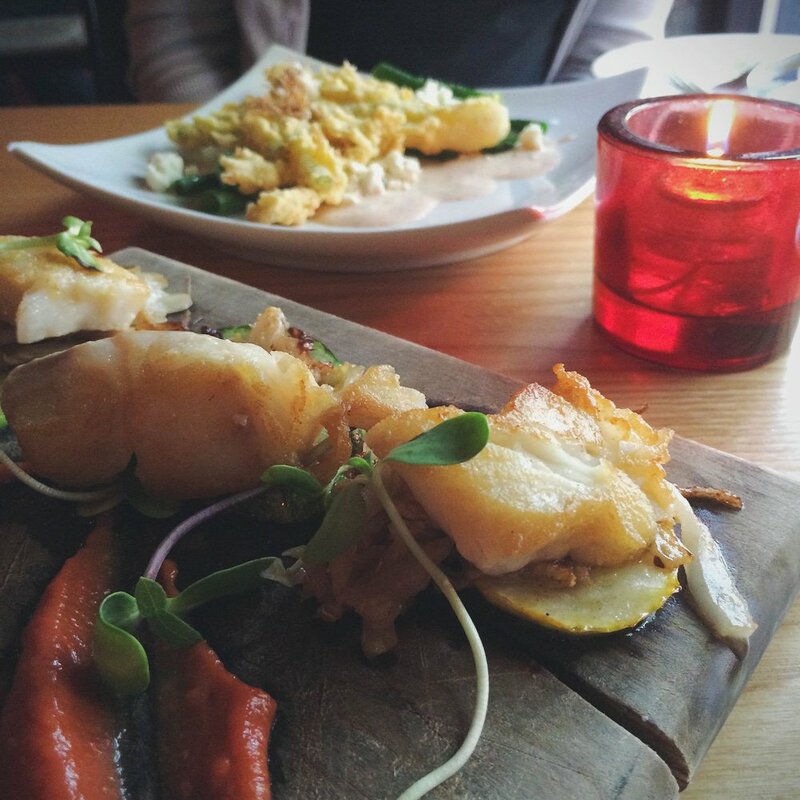 You’ll find regional takes on traditional tapas dishes that exemplify the history and culture of New England. The ingredients are sourced locally with food suppliers proudly listed on wooden placards near the bar. Chef/owner Matt Louis has deep local roots. Born and raised in southern New Hampshire, his love for cooking started at a young age. It was in the kitchen of the hotel that his father managed at Hampton Beach, NH where Chef Louis realized his passion for food. After receiving his degree from the Culinary Institute of America (CIA) in New York, Chef Louis worked under famed chef Thomas Keller. He refined his skills at Keller's critically acclaimed restaurants Bouchon, The French Laundry, and Per Se. The love for his home would eventually bring Chef Louis back to New England. Upon returning to New Hampshire, he worked as an instructor in the culinary program at Southern New Hampshire University and was the Executive Chef at the iconic Wentworth By the Sea in New Castle, New Hampshire. In 2012 he partnered with successful restaurateur Jay McSharry and opened Moxy on a quiet side street in historic downtown Portsmouth. To get a sense of Moxy’s true identity, you really have to look at the menu. It doesn’t get any more New England than Moxy-made mini red hot dogs on a When Pigs Fly grilled bun, topped with NH bacon-fresno chili marmalade, Boggy Meadow's swiss, and Raye's mustard. How about Wiley Point oysters with lilac mignonette and shaved fennel-milkweed blossom? Or maybe some classic crispy Rhode Island calamari, celtuce, scallion and spicy pepper relish? Options are plentiful for the non-meat eaterstoo. Chef Louis excels in preparing locally grown and foraged vegetables and mushrooms. He clearly wants the local flavor to shine in every bite. “It's incredible and inspiring sourcing food and building a menu like this. We print our menus in house everyday, so if something isn't available, we just change the menu. Anyone can order from a big truck and a broadliner, but what's the fun? And what are you doing to help the economic circle of your local community? By talking with, interacting with, building relationships with the ones growing and caring for the product...that is purpose, that is depth. Does it take a little more work? Maybe... but doesn't everything worth doing?” said Louis. “Portsmouth was the only choice for me... an absolutely incredible and dynamic town, a great vibe and scene, and lots of people from many different professions that are dedicated to their passion...the energy of Portsmouth is what I love, the community of it, the history and modern aspects all cohesively coexisting in a unique culture that just feels good.